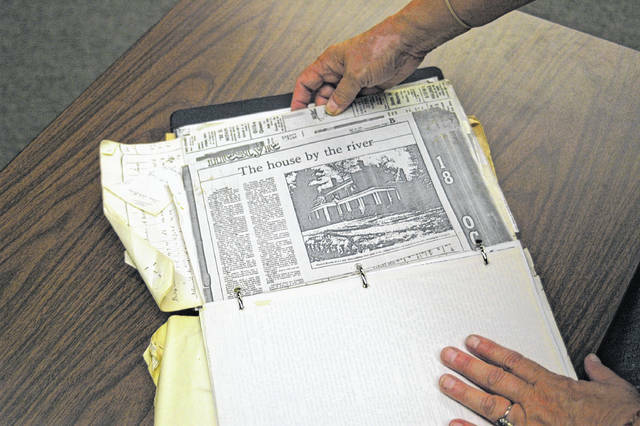 The Gallia County Historical Society also has kept running collections of columnists from the Daily Tribune, something Sands did for three decades or more. With his complete works now at the society, this will be expanded. 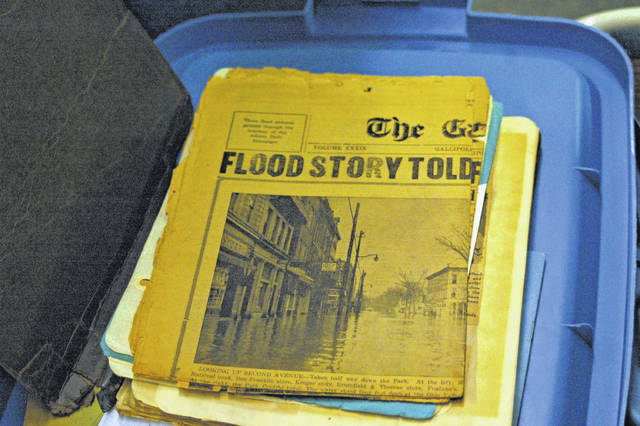 Sands also had a habit of collecting old newspapers with major historical significance, including this copy of the Tribune showing Second Avenue underwater. Notice the Central Park Hotel, which is no longer standing. 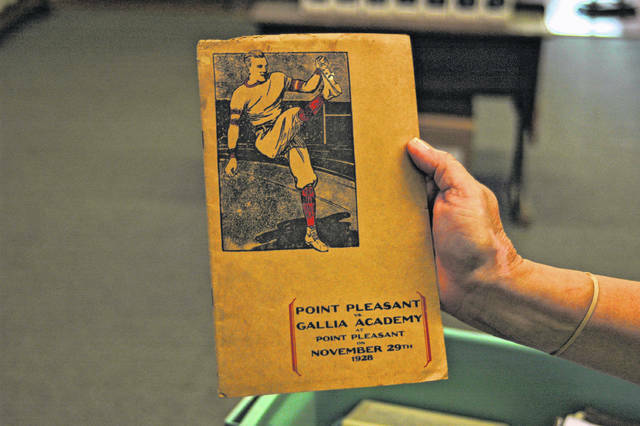 Some of the unique items from Sands’ collection include this pamphlet from a 1928 matchup between Gallia Academy and Point Pleasant. 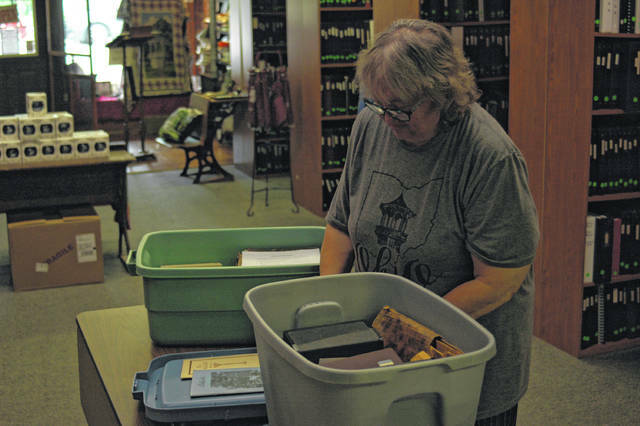 Cheryl Enyart and the volunteers have more than five totes of notes, books, and pictures to sort through and display at the Historical Society. 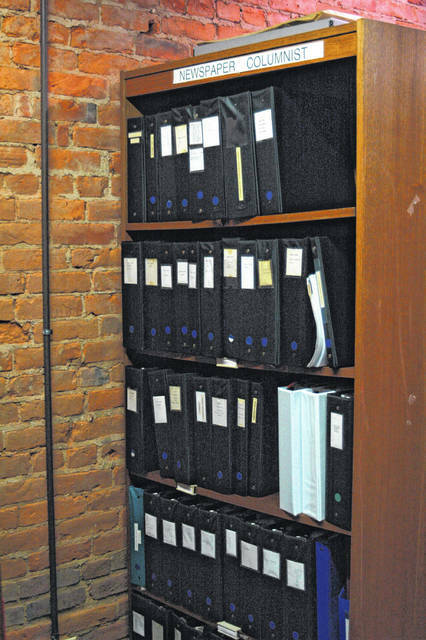 Sands kept notebooks full of research from other articles from the early days of the Gallipolis Tribune. Sands also had hundreds of photos, both his and others, of local residences and landmarks. Some of these are not identified, and the society will be asking for help from the public to label some of the buildings and people in these pictures. GALLIPOLIS — The Gallia County Historical Society (GCHS) has recently received a donation they are calling invaluable. James Sands was a pastor and regular writer for the Gallipolis Daily Tribune for years. His research and breadth of work was always noticeable in his writings, however his meticulous method of research and keeping all of his notes has been more recently revealed. 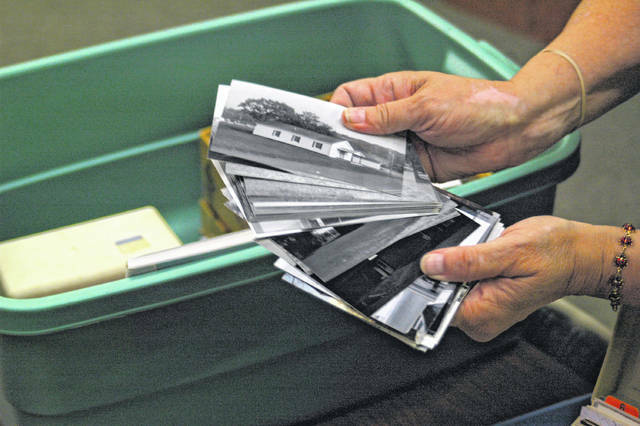 Sands, having passed in 2016, left his family with numerous totes containing books, research, hand-written and typed notes, photos, and articles on topics ranging from local church history to sports to the homes and architecture across Gallia. Sands’ family donated all of this to the Gallia County Historical Society, which now has the daunting task of sorting and displaying the contents in a useful and efficient way for the public. The task facing the society is how to display and organize so much material. Some of the pictures are not labelled and are of buildings that are no longer standing or of people that have since moved away from the area. According to Enyart, just being able to get all of the pictures into binders will be a momentous task. “It’s going to be a slow process unless I get volunteers. If people can come in an put photos into sleeves for an hour, I mean how many pictures can you put in a binder in an hour? Every bit will help,” said Enyart. Enyart said that many people come to the historical society wanting to learn more about their homes and the history of a house they just bought. Mary Lee Marchi also uses Sands’ work for her Gallipolis in Pictures, which displays historical landmarks across Gallia. Sands first began submitting his columns to the Gallipolis Daily Tribune in 1975, and continued to submit his writings even after he moved away from the area. The addition of Sands’ collection to GCHS is one that will take quite a time to process, but one that will be immensely valuable to the historically minded members of the public. If you are willing to help sort, organize, and display some of Sands’ work at the Historical Society, contact them on Facebook or give them a call at 740-446-7200.